This marks my first year experiencing Universal Studios Hollywood Lunar New Year! It is primarily in the same courtyard area as where Grinchmas is held, but you can find some Lunar New Year merchandise and food offerings here and there throughout the park. I went around the park to try out their vegan + vegetarian food offerings, as well as other special things to experience during this celebration happening until February 18th. Plaza Grill: Vegan Bahn Mi sandwich (pickled veggies, served cold and with chips on the side), and Year of the Pig sugar cookies. DreamWorks Concession Stand: (If you’re in for a sweet treat, they have some amazing stuff!) PB&J dumplings, year of the pig sugar cookies, green tea churros, red bean cake ice cream, melon ice cream bars, green tea lychee Icees, and Passionfruit Orange Icees. And the highlight that draws lots of attention online each Lunar New Year at Universal is visiting Mr. Ping! 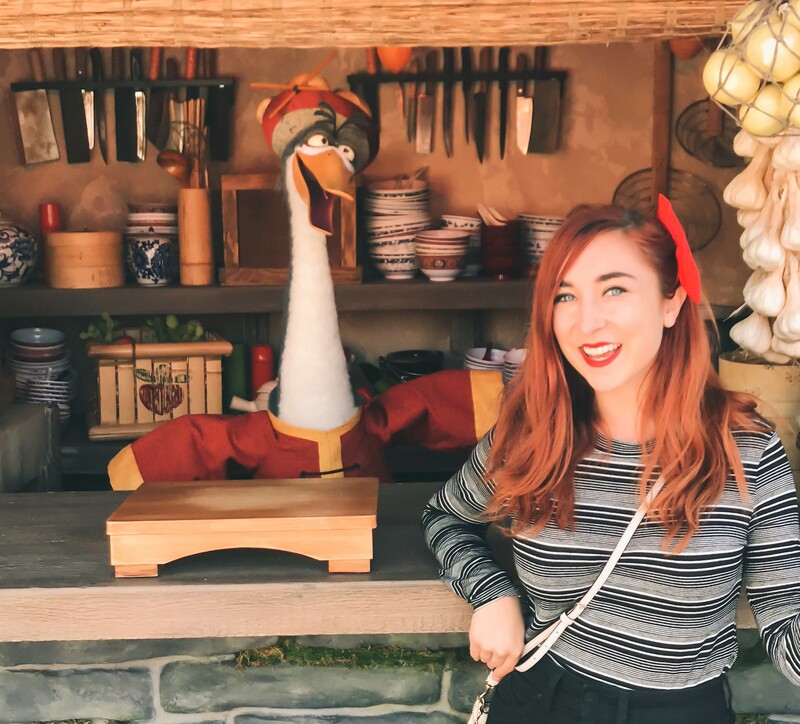 Located right next to Mr. Ping’s Noodle Shop, you can not only take a picture with Mr. Ping but interact with him in real time. I had a fun time asking him what his favorite vegetarian item was from his noodle shop! Kung Fu Academy: An interactive dragon warrior kung fu training show that kids can participate in. Wishing Trees: These are located throughout the plaza, where you can place your New Year’s wish on a cherry blossom tree! Feng the Palace Artist’s Stand: You can learn to draw the Dragon Warrior and Furious Five! Times throughout the day. I absolutely loved my afternoon at Universal Studios Hollywood to experience Lunar New Year 2019! My favorite things were the vegetable stir fry noodles, the red bean cake ice cream, and talking with Mr. Ping! Be sure to visit by February 18th to experience the celebration!